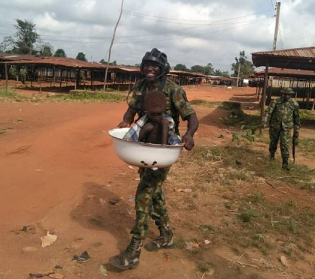 The child was found during a search-and-rescue operation for a soldier, L/Cpl Oluwabukunmi Fadoju, who went missing since September 17, 2018. 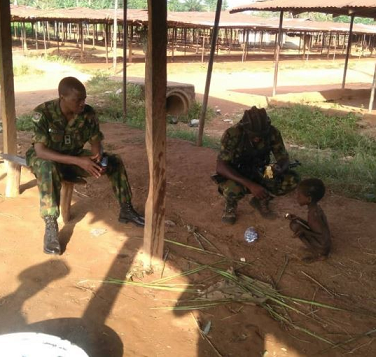 On arrival at Onunwakpu in Izzi Local Government Area of Ebonyi State on November 16, 2018, the soldiers were said to have discovered the malnourished child locked up in a house. The child was seated on what appeared to be charms and was picking leaves from the ground to eat. The charms were burnt and the child was given some bananas and biscuits. 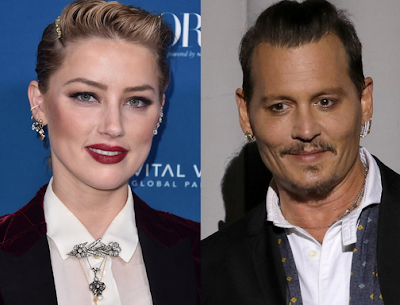 He was, thereafter, taken to the Medical Reception Station for treatment. 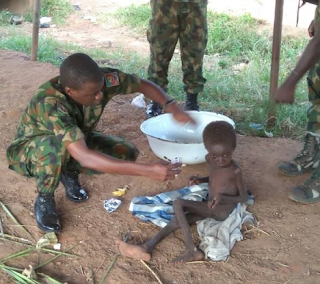 JUST IN: Troops Discover Abandoned Malnourished Child in Ebonyi State. Troops Discover Abandoned Malnourished Child in Ebonyi State. During search and rescue of a soldier L/Cpl Oluwabukunmi Fadoju who got missing since 17 September 2018.